Commentary on the strange case of Judas Priest and their music. 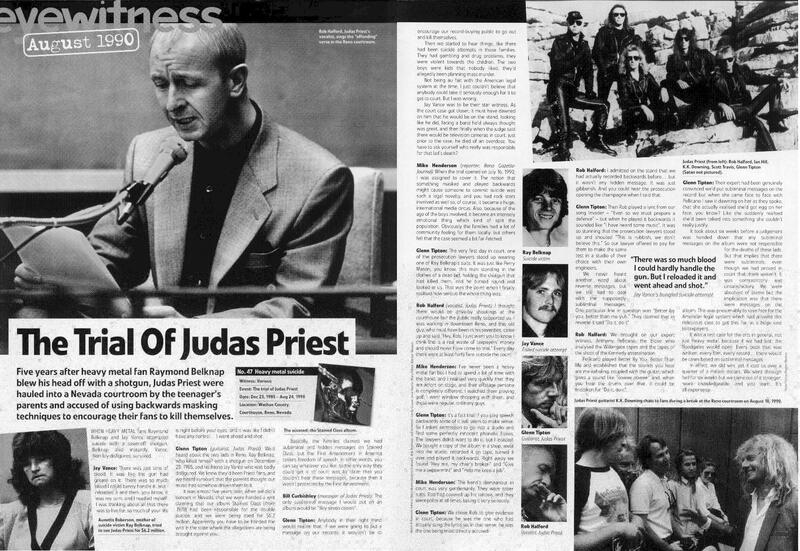 In 1990 a rather bizarre court case involving the Rock band Judas Priest caught the public imagination. The way in which the case was reported undoubtedly gave many people the wrong impression about the possibility of subliminal messages influencing those who heard messages reputedly embedded in records, CD's and audio tapes. This page aims to try and set the record straight ( pun intended ). Before you proceed you might like to view some of an original magazine article. Caution. If you click on any of the pictures you will be linked to a full size image of the magazine article. This may take some time to download. For smaller 'bite size' chunks click on a section of the image map containing text. This will link you to smaller images containing sections of the text. The British Psychological Society have produced a report on Subliminal Messages. This addresses the research focussing on embedding subliminal messages in records and audio tapes. Unlike the very limited amount of research into the semi-subliminal contents of printed adverts this research into truly subliminal audio communication has been very rigorous. The research conclusions when applied to audio tapes and similar electronic media are unequivocal and beyond dispute other than on the basis of ones beliefs. See for example the books by Eldon Taylor for an eclectic, individual, viewpoint that runs contrary to the systematic research of many professional investigators. The research reported in the British Psychological Society booklet indicates that the only impact embedded messages would have is on the basis of a placebo effect i.e. a response influenced by a belief in the effectiveness of something that cannot itself be observed to have an influence. Various research studies have made use of specially prepared tapes. Other studies have used tapes acquired from commercial sources. The latter tapes were associated with claims that subliminal messages were embedded within the soundtracks on the tape. With regard to the commercial tapes, it is clear that regardless of the message claimed to be embedded in the sound tracks that message is irrelevant to any impact on listeners. By swapping tapes, for example swapping tapes claiming to build confidence with those claiming to cure alcohol problems, it can be conclusively demonstrated that the beliefs of the user is all that matters. In addition when tapes containing no message were substituted for tapes containing embedded messages they produced the same outcome as those which contained a message or a misleading message. If one moves up the spectrum from subliminal messages to present semi-subliminal communications on the borderline of auditory ability it is again clear that beliefs (or priming) play a large part in determining the outcome. When there is variation in random, meaningless, sound then listeners are still likely to believe they can hear words or phrases rather than simply variation in sounds. Although extrapolation of research conclusions from one sensory field to another may be appropriate in some circumstances, where visual and audio material is concerned this does not seem to be the case. This is because sound tracks present a linear sequence of sound over a period of time and when a message is embedded in a soundtrack the sounds merge. Visual imagery, on the other hand, is not linear and is spread over two or three dimensions. Additionally, when the non-specialist listener hears sound it can only be 'stored' in memory for a short period of time. The viewing of printed information, provided it is not removed from the visual field, can be reviewed time and time again by anyone. Additionally, even if there is no opportunity to review a scene, attention can be directed to specific aspects of a visual scene in a manner that has no direct equivalent with the different elements of a soundtrack. A critical article by Timothy Moore, presenting much of the evidence relating to the Judas Priest Trial, can be read, in full, by clicking this link to the CSICOP web site. If you would like your own personal Subliminal Message Programme check out the Download page. It's just for fun - but it might work if you benefit from the placebo effect. 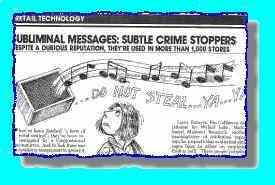 Taking for granted the premise that listeners can detect and respond to subliminal messages, various companies have produced tapes claiming that their use will reduce shoplifting. Given the clear cut research findings noted above there seems little evidence to support such claims. If there has been any reduction in shoplifting in stores using such tapes then such reduction is most likely to have come about because of the greater degree of attention being given to the subject of shoplifting. Light fingered members of staff, for example, would become acutely aware that management and their colleagues were taking a greater than usual interest in who did what. Additionally, some criticisms of such commercial applications claim that the embedded messages were not truly subliminal. They may thus have been heard by shoppers. 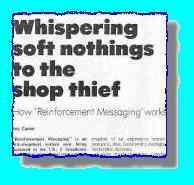 However, whether or not taped communications are truly subliminal is irrelevant where practical applications intended to reduce shoplifting are concerned. The important question is 'Do they work?' If they work the tapes ought to be promoted on the basis of their effectivness, even if this is an indirect social phenomenon associated with use of the tapes rather than any effect arising from 'hearing' the messages reputedly embedded in the tapes. What ought to be discouraged is the sale of such tapes when their alleged effectiveness is based only on anecdotal and inadequate evidence associated with a pseudo-scientific phenomenon from the 1950's and dubious data. On the CSICOP site you can view an article reviewing some of the evidence relating to such messages. The full text of these articles can be traced by using either the full illustrated bibliography or the miscellaneous subsection of the bibliography. 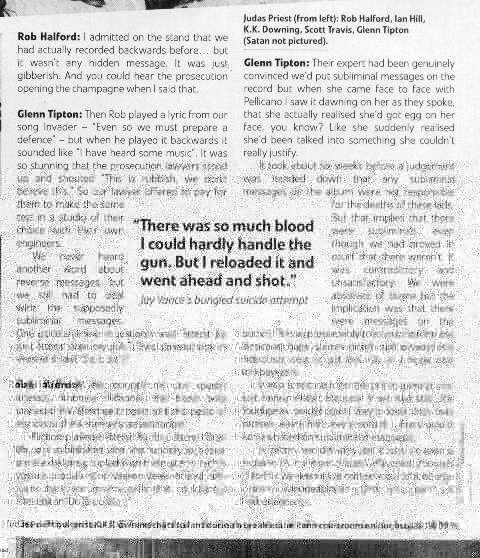 Timothy Moore's article from the Skeptical Inquirer (SCICOPS).